Charlotte is most known for banking, finance and craft beer, but the city has quietly become more of a tech hub in recent years, helped along by events like hackathonCLT. Local AI software company Tresata has been hosting the annual hackathon here since 2013 to provide data-based solutions for the people of Charlotte. During these 24-hour collaborative tech marathons, teams of up to three use sets of population data to design and ultimately present a solution to a given problem, which changes each year. This year’s hackathonCLT will begin on March 22 at Discovery Place Science in Uptown and will address five core health issues in Charlotte: access to care; mental health and suicide; chronic disease prevention and management; communicable diseases and sexually transmitted infections; and violence prevention. Sherrell Dorsey, founder of BLKTECHCLT and marketing and community engagement consultant for Tresata, said the event creates efficiencies for the community to move forward toward solutions. “Healthcare is changing drastically and having an outlet to help tap into huge data to make healthcare much more efficient is super, super significant,” she stated. While Charlotte hasn’t always been known as a tech-centric city, events like hackathonCLT allow the city to highlight tech talent while also bridging the community at large with tech-driven solutions. For the event, pre-registered teams are given a set of big data, or sets that have to be analyzed systematically to extrapolate trends and information. Using this information, the teams design and present a solution to a panel of judges for the chance to win cash prizes totaling $30,000, and the winning team given the opportunity to work with UNC Charlotte’s Academy of Population Health and Innovation to execute their project in the real world. Before hackathonCLT, Charlotte didn’t have a large-scale event that addressed issues in the city using civic tech, a subset of technology used to connect communities with city leaders and problem solvers. 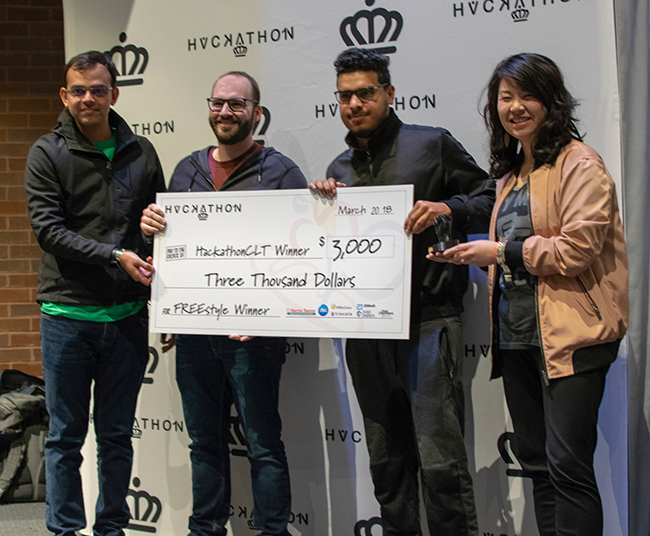 Organizers Abhishek Mehta, CEO of Tresata; Jim Clendenen, vice president of enterprise retail systems at Kroger; and Brittany Box, CAO of Tresata established the 24-hour data-hacking marathon to bring together tech talent. At 8:30 p.m., the hackers are “released,” and have until 9:30 a.m. March 23 to wade through the large sets of data and develop and design projects. By noon, the presentations for health solutions in the city begin. Dorsey hopes for a wide variety of solutions delivered to the judging panel. As for hackathonCLT, there’s also no limit to the impact it will have on tech Charlotte and the future of the city. hackathonCLT; Friday, March 22, 5 p.m.; Free; Discovery Place Science, 301 N. Tryon St.